Grace Reinhart Sachs is a Manhattan psychotherapist living a life of wealth and privilege. She lives in the same Park Avenue apartment that she has all her life, given to her by her father. Her husband Jonathan is a pediatric oncologist who saves lives and earns the lifelong gratitude of families, and he treats Grace very well, showering her with attention. They have a 12-year-old son Henry who attends an exclusive private school, giving him a wonderful education. 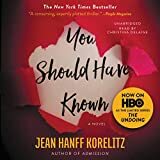 Grace has a new book coming out, titled "You Should Have Known," which tells women that they have all the information they need to make the right decisions in relationships, but that they hide from this information and so run into problems that put them into therapy, when they could have seen it all coming. She prides herself on having avoided the problems she sees in her clients. So of course it's no surprise Grace's life turns upside down when she comes to face the reality that her husband has been leading a life very different from what she formerly believed. We see her life start to fall apart and the friendships she thought she had evaporate when the going gets tough. But although she has a terrible time, she finds the resources to cope and she comes to take her own advice. As a depiction of the life of the wealthy in New York, this novel is detailed and somewhat convincing. But as a depiction of therapy, despite being nearly 500 pages, it is skimpy and uninformative, which is disappointing for a book that features the wisdom of a therapist so centrally. We see Grace cope with a major restructuring of her life, and see her thoughts as she undergoes a loss that would tear most people apart. It's quite a linear plot, with no surprising twists or turns, and it ends with one wondering whether that's all there is. It is entertaining as social commentary but it doesn't provide any great insights. The unabridged audiobook performed by Christina Delaine; it's a professional recording that makes the story easy to listen to.